It is very difficult to keep your eyes on the road. 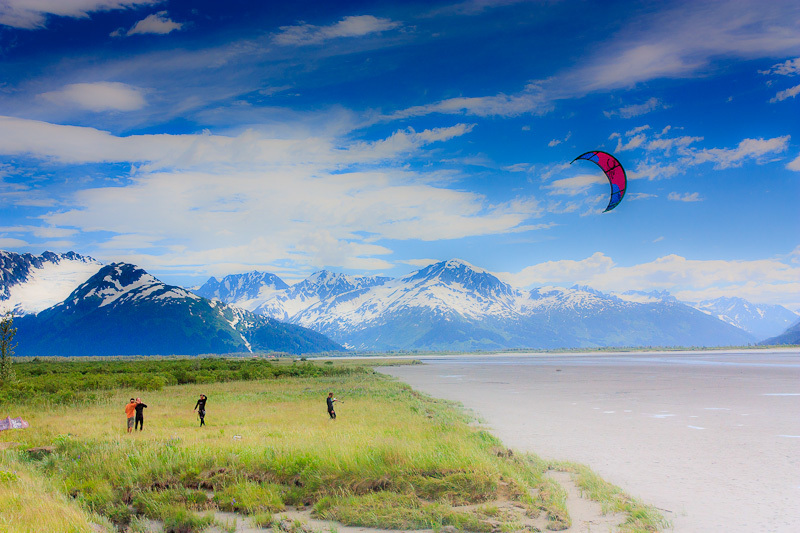 You can see why from the above photograph, a few guys Kite surfing right next to the Seward highway. Running through the scenic Kenai mountains, Turnagain Arm and Kenai Peninsula, Seward highway from Anchorage to Seward has to be one of best places to drive in the world. I pulled over many a times to appreciate the beauty of the picturesque landscape as I drove on a bright and clear sunny day. After flying back from Katmai photographing Bears, I Couchsurfed at Brian’s place in Anchorage for a night. I had rented a car from the Anchorage airport. The following day, I drove towards Seward. The weather was incredible, with clear skies and bright sun. I was lucky since most of the summer days are drought with rain. 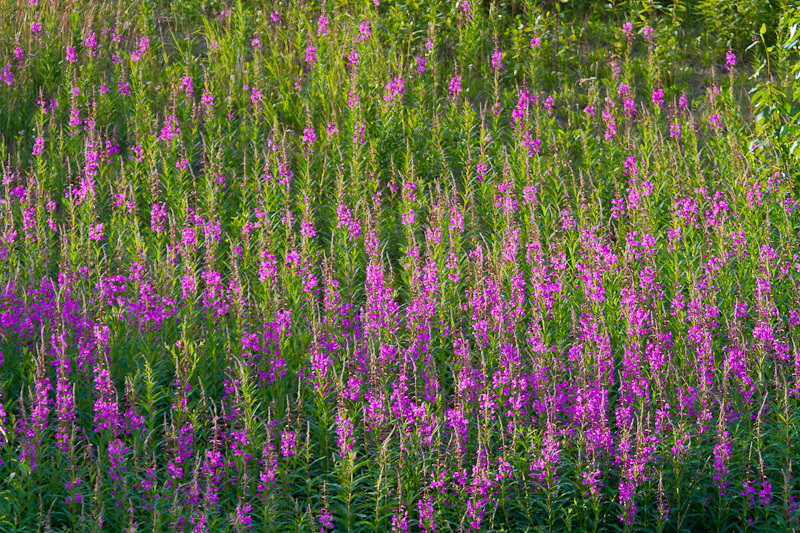 July is a very busy time of the year in Alaska. Salmons, Halibuts, Trouts and other fish attract anglers from all parts of the world. This means getting a place to stay would be quite a challenge if you don’t book in advance. I decided to stay at Moose Pass for a night, a short distance from Seward. Whale watching and glacier cruise was on my plan. After reading up on reviews for cruise on into the Kenai Fjords National Park, I was more than sold to take the cruise. However, I had not booked until I get to know the weather forecast for that week/day, as suggested by some. Rain and rough sea could not only make wildlife sightings rare, it would also make my cruise very uncomfortable. This proved a costly miss as I couldn’t get on the smaller ‘photographers boat’. I instead choose the Northwestern Fjords cruise, covering almost the same route lasting from 8:30am to 5pm. I missed sighting an incredibly rare mammal, Wolverine, that Dario and Max saw on the other boat. However, my consolation was to watch a humpback whale mom and calf for a good 30min. 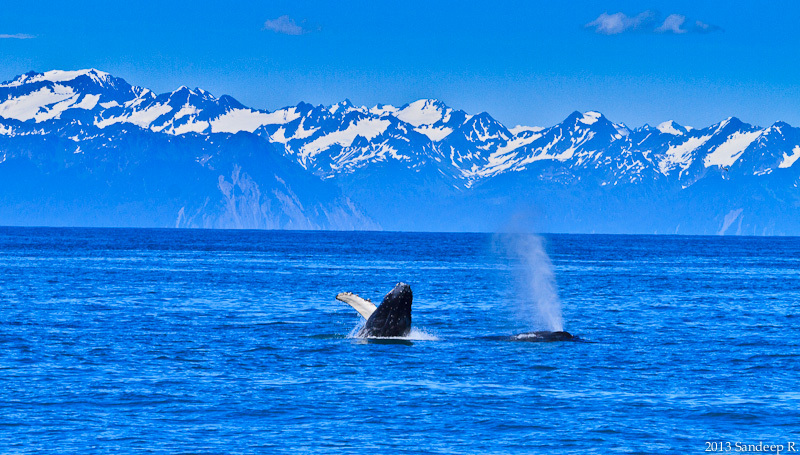 The cruise is as much for wildlife as it is for the glaciers at the Kenai Fjords National Park. There are many glaciers on slightly different routes near Seward. Exit Glacier is one that can be reached on road by car. Although the glacier itself was not as impressive as some of the others I saw while on cruise, there is access to Harding icefield. It was an all day hike to the icefield and I had not planned for it. May be next time! Another place I was considering for wildlife and glacier cruise was Prince William Sound. 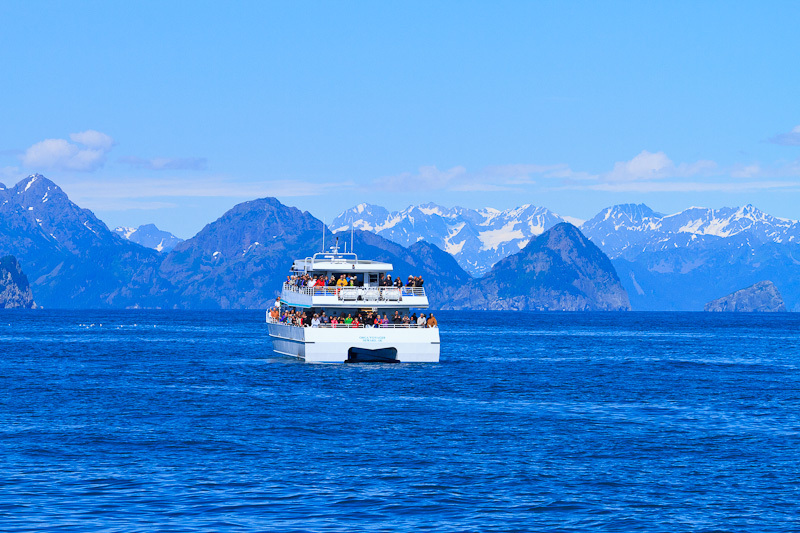 Seward, however, is the more popular one with at least two cruise companies operating from Seward harbor on a variety of cruises, lasting a few hours to all day cruises. I chooses the all day cruise to the Northwestern Glacier, named after the university. It was an incredible experience. The chill in the wind and the sound of the glacier caving as you watch it from up close is an experience that is to be felt. No words, images or videos can make justice to that experience. NortheWestern Glacier. 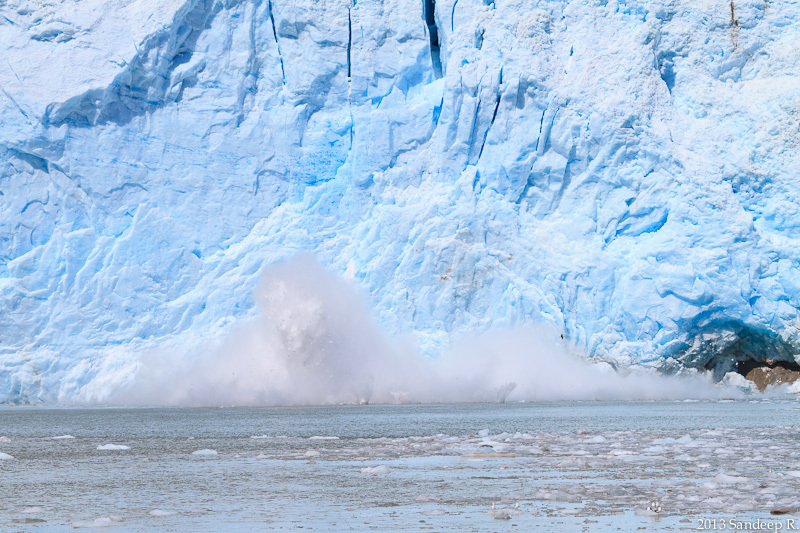 Glacial calving is a natural phenomenon. However, the rate at which glaciers are retrieving is effect of climate change. The challenge of photographing wildlife on a boat is something totally different. First, it is hard to anticipate where and when do the creatures breach or come to the surface. Second, the rocking boat makes it even harder to compose and focus. Fortunately, the sea was calm. It still was quite a challenge. Sea Otters, Harbor seals, Loons, Sea Cormorants, a variety of Terns, Tufted and horned Puffins, Dall Propoises, and Humpback Whales were all a treat to watch. 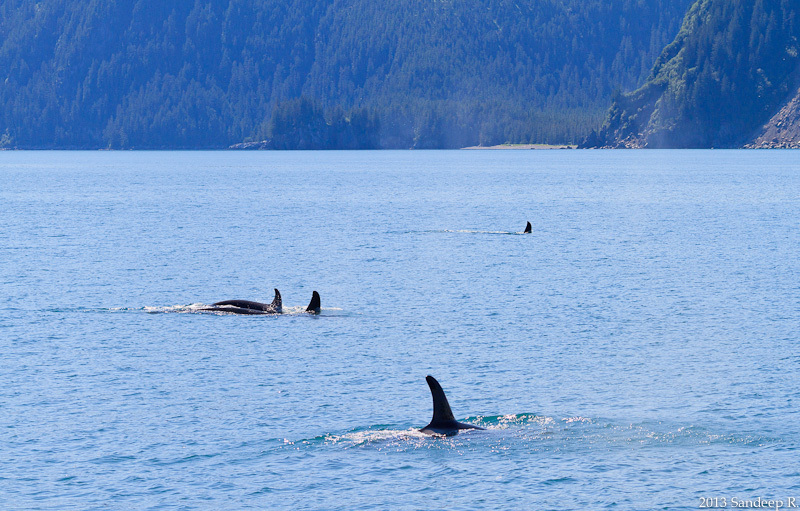 Towards the end of the cruise, we chanced upon a pod of Orcas. Orcas are the Elephants of the oceans, with a matriarchal society with a strong social and communication structure. The dubious reputation of ‘killer whales’ where they kill humans is the fictional creation of hollywood. ‘Blackfish‘ is an excellent documentary on how these beautiful creatures are tortured and confined into small pools for entertainment at SeaWorld and similar places. Please do watch Blackfish on Netflix. After the cruise, I started towards my stay for the next day – Ninilchik. The drive didn’t yield much exciting except a pullover for speeding. Fortunately, I was let off with a warning – respect for Alaskan troopers. Ninilchik is a small Russian village. Yes, Russian. It is a fishing village on the banks of Cook inlet. The place I had booked to stay in Ninilchik village was one of the most beautiful places you can have your vacation homes. Perched atop a small ridge cliff, the house overlooks the Cook inlet bay and the two volcanoes, Mt. Iliamna and Mt. Redoubt, on the other side. Mt. Redbout erupted as recently as 2009! Watching the sunset from there was one of the most spectacular views. Brain had told me visiting the beach at Ninilchik for the spectacular views of sunset behind the volcanoes and I didn’t know if will have time. To view it from the backyard of my stay was truly special. 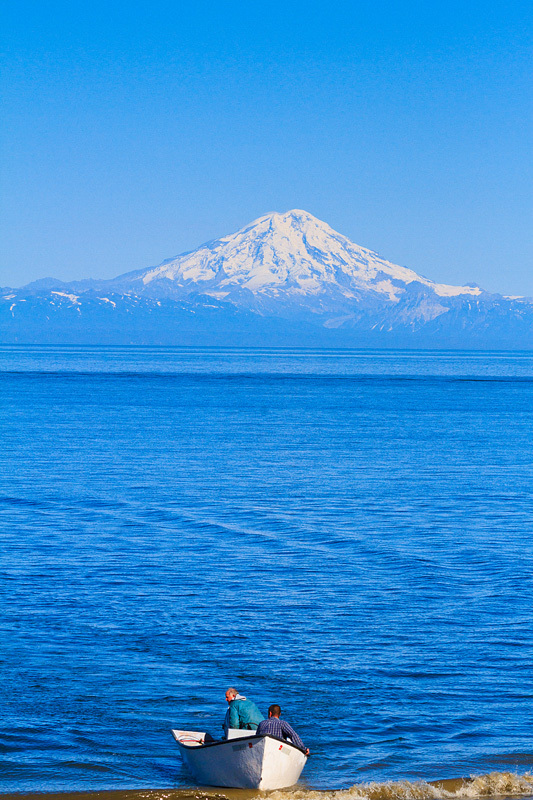 Cook inlet is another great location for Halibut fishing. The beach at Ninilchik is the starting point. I saw numerous fishing boats early in the morning set out. I, on the other hand, was there for a different reason. 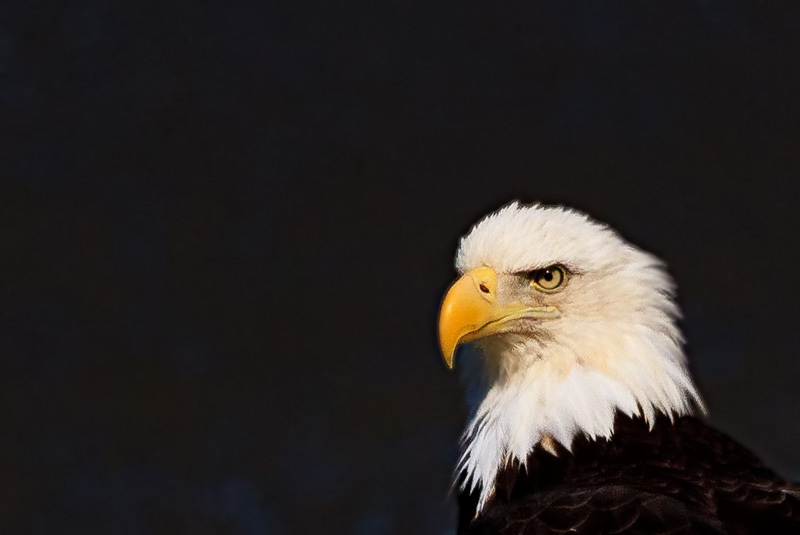 Bald Eagles. Though I had good views of the eagles fishing at Katmai, I had not got a closer portrait photograph that I wished for. This was the place. The beach also serves as a dumping yard for halibut remains after cleaning the fish. 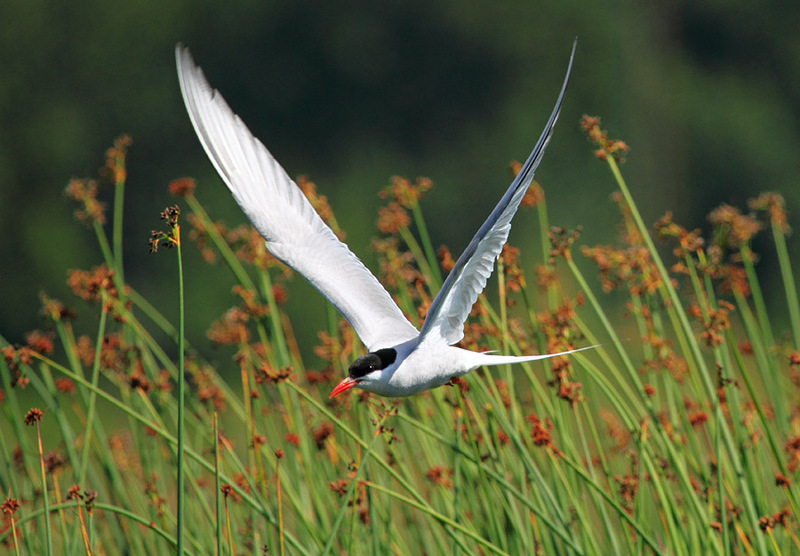 This attracts the eagles, terns and many other birds. 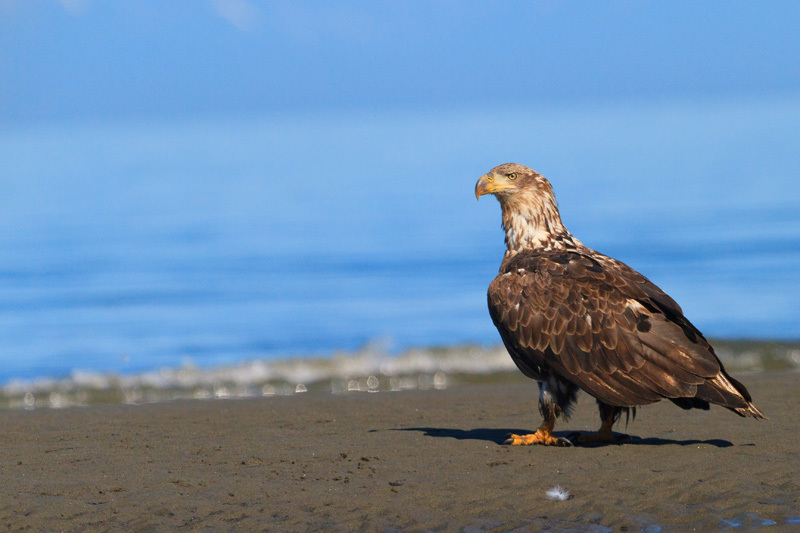 I saw at least 50-60 Bald Eagles on the mile long beach shore in the morning. 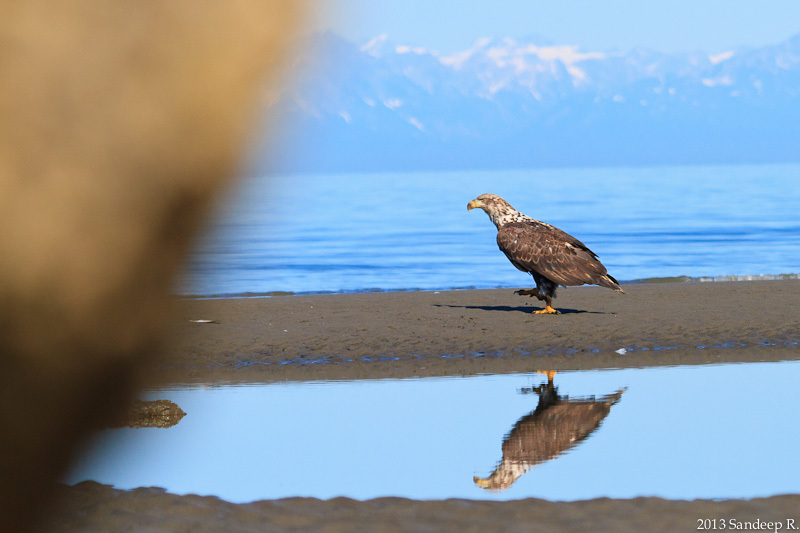 The cliffs on the edge of the beach provides a good roosting spot for the eagles – higher and out of reach from the beach and inaccessible from the road on the other side. I spent the entire morning without much success as they would fly away despite my cautious approach. The open beach meant no cover for me to sneak up close. Until, I found a few rocks on the shore. On my last evening in Alaska, I went looking for another popular mammal and bird to Kenai – Caribou and Sandhill crane. I was driving around in the areas I had researched before without much luck. I pulled over to a viewing area. Time was running out. I was 3 hours away from Anchorage airport. Then, I saw a Crane. I was excited. Though I couldn’t get close for lack of time and restrictions placed for the birds’ comfort. Soon, I saw a herd of Caribou far across the horizon. It was such a awesome feeling as I were to wrap up my trip and head to Anchorage for my flight back to LA. I photographed as late as I could. However, Caribou still remains on my list for a better photograph. Here are few more images. Cleaning Halibuts at Seward Harbor. 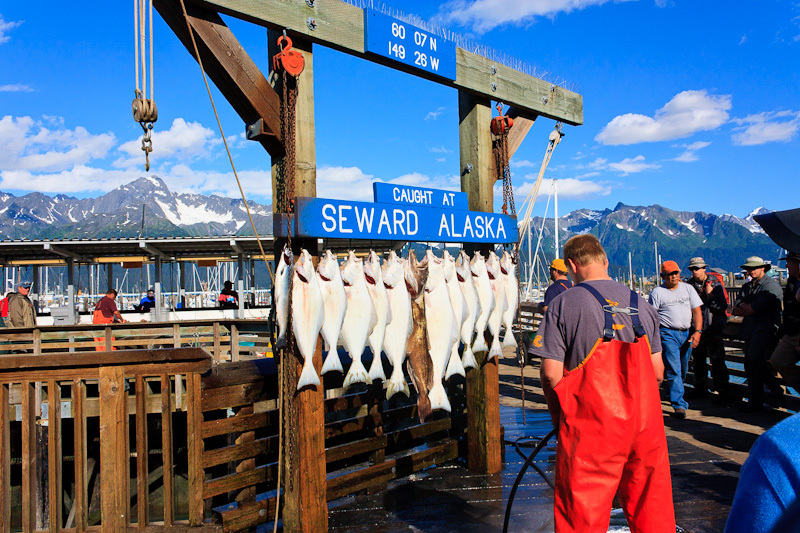 July is a very popular time for fishing in Alaska. 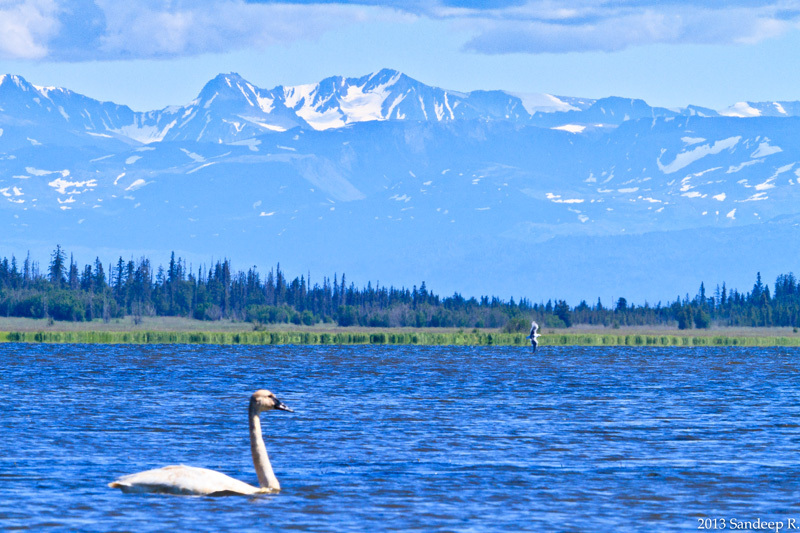 A Swan at Homer. Views of mountains never go away in Alaska. A pretty Mallard female – lands right in front of me as I was photographing the Swan above. 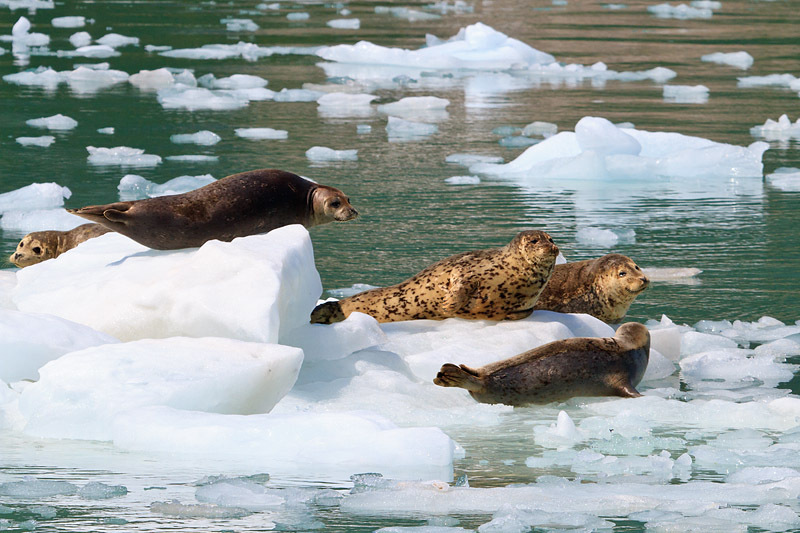 Harbor Seals resting on glacial ice to conserve energy – Don’t they get cold? That’s all folks! Please drop me a note if you wish to visit any of the places and get some tips on photographing the species in the Alaskan peninsula. Although not an expert of the location, I have spent considerable hours researching on times to visit, roads to take and locations to wait at to photograph the many of the species in the region.